Two weeks ago I passed in Cologne, Germany. I first spotted a 'traditional' Space Invader in the Hohe Strasse. 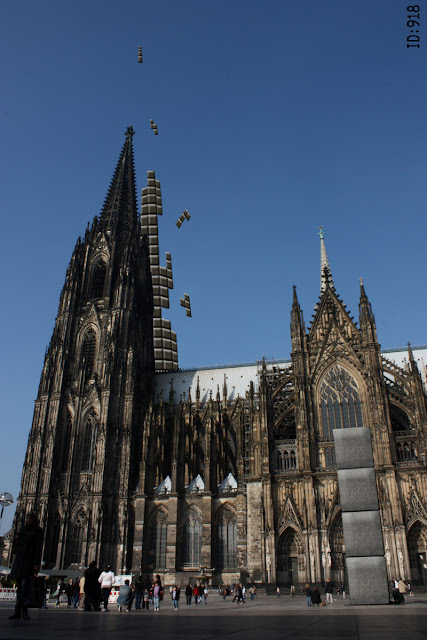 Now, Space Invaders are nothing new, however fascinating, they've succesfully invaded Germany years ago. 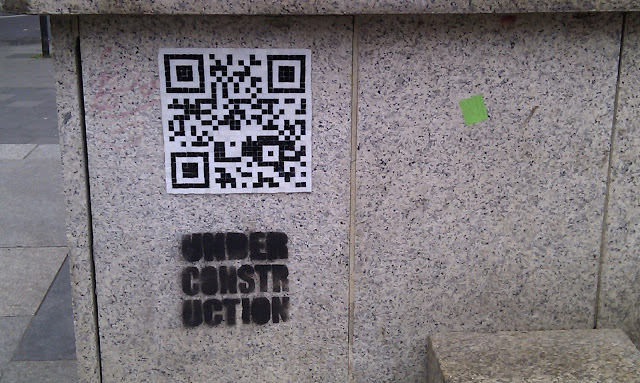 More interestingly, I found a QR code in the same kind of mozaic style, just next to the Dom. (Should we call it QaRt)? When you load this picture in Google Goggles, it takes you to a blog that's under construction. For good usability that was actually already painted below anyway, so you shouldn't be too dissapointed. There is a picture though, with the exact view from where you would be in front of the QR code. That gives at least vague idea of what it might become. In the picture you see Tetris like cubes falling from sky, building a tower that mirrors the authentic one and a huge block on the square in front. It appears the blogpost dates from oktober 2010 so that's pretty recent too. If you consider the possibilities of augmented reality this little piece of street art could virtually go in all directions. For now, all we can do is wait, see and watch street art getting interactive.